At the invitation of Premier Li Keqiang of the State Council, Prime Minister Xavier Bettel of the Grand Duchy of Luxembourg will pay an official visit to China from June 11 to 14. At the invitation of Foreign Minister Wang Yi, Foreign Minister Vivian Balakrishnan of the Republic of Singapore will pay an official visit to China from June 11 to 12. Q: According to the Yonhap News and some other ROK media, US Secretary of State Rex Tillerson, when jointly meeting the press with New Zealand Prime Minister Bill English, said that "all the regional partners, including China, have reaffirmed without question their commitment to a de-nuclearized Korean Peninsula. And so now I think the question is: how do we work together collectively to bring Pyongyang to the table." How do you comment on that? A: We have noted the remarks by US Secretary of State Tillerson. China has stressed many times that the Korean Peninsula nuclear issue has existed for a long time and is highly complicated, which must and can only be settled by accommodating and resolving the reasonable security concerns of various parties through dialogue and negotiation and addressing both the symptoms and root causes. Now there is a crucial window of opportunity for us to bring the Peninsula nuclear issue back to the track of resolution through dialogue and negotiation. The international community should step up efforts for non-proliferation and peace talks and jointly push for an early peaceful settlement of the Peninsula nuclear issue. We have noticed recent messages from the US of solving problems through dialogue and negotiation, which is in line with China's "parallel-track" approach and "suspension for suspension" proposal. We hope that relevant parties can bear the general picture in mind, seize the opportunity, demonstrate sincerity, and make constructive efforts to push for denuclearization, peace and stability on the Peninsula. Q: The Pentagon claimed in its annual report on China's military and security developments on June 6 that, following the construction of a military logistics facility in Djibouti, China is likely to establish additional military bases in countries with which it has longstanding friendly relations, such as Pakistan. How do you comment on that? A: Since you just mentioned the US Defense Department's annual report of "Military and Security Developments Involving the People's Republic of China", I will first comment on the report as a whole. We have noted the report. 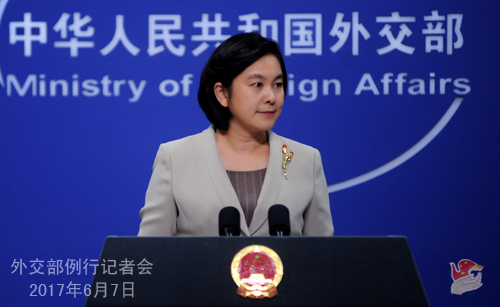 In disregard of facts, it made irresponsible remarks on China's national defense development and legitimate actions to safeguard territorial sovereignty and security interests. We firmly oppose it. China follows unswervingly the path of peaceful development, upholds a defense policy that is defensive in nature, and remains a staunch force for peace and stability in the Asia-Pacific and beyond. China's national defense is for the purpose of upholding national independence, sovereignty and territorial integrity, which are a sovereign state's legitimate rights. We hope that the US side can discard the Cold-War mindset, put China's military development in an objective and rational light, and take concrete actions to uphold the steady development of China-US relations and the military ties. On your question about the alleged construction of military bases in Pakistan and other countries friendly with China, I will not comment on conjecture. But I would like to stress that as neighbors with traditional friendship, China and Pakistan have conducted broad cooperation in various fields for win-win results and mutual benefits for a long time. The China-Pakistan friendly cooperation does not target any third party and conforms to each other's international commitments. 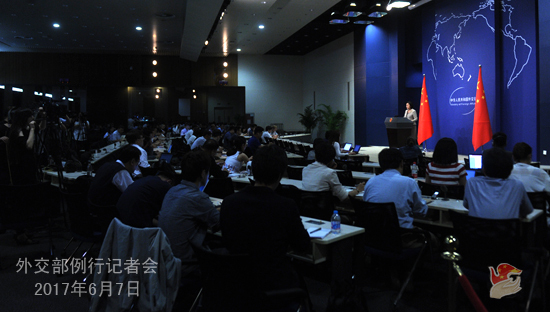 Q: The above-mentioned report also claimed that the US opposes any unilateral change to the status quo in the Taiwan Straits by either side and does not support "Taiwan independence" and maintains a one-China policy that is based on the three joint communiqués and the "Taiwan Relations Act (TRA)". It also mentioned that, consistent with the "TRA", the US has contributed to peace and stability in the Taiwan Straits, including by providing defense articles and services to enable Taiwan to maintain a sufficient self-defense capability. What is your comment on that? A: China's stance on the Taiwan question has been consistent and clear-cut. The so-called "Taiwan Relations Act" unilaterally enacted by the US severely violates the one-China policy and the principles of the three China-US joint communiqués. The Chinese government has firmly opposed it all along. 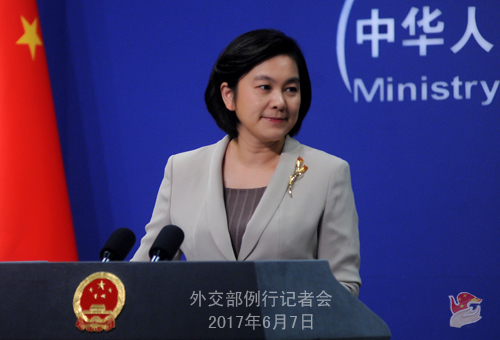 China requires the US to honor the one-China policy and the principles of the three China-US joint communiqués, cease arms sales to and military ties with Taiwan and cautiously handle Taiwan-related issues, so as not to hurt the overall interests of China-US relations and cross-Straits peace and stability. Q: It is reported that President of the Nepali Congress Party and former Nepali Prime Minister Deuba was elected as the new Nepali Prime Minister on June 6. How do you comment on that? A: China congratulates Sher Bahadur Deuba on his election as Nepali Prime Minister, and Premier Li Keqiang has sent a congratulatory message to him. As a friendly neighbor, China sincerely hopes that Nepal will make new achievements in national unity, social stability and economic development, and looks forward to joining the new Nepali government in moving forward China-Nepal friendship and mutually beneficial cooperation. Q: I wonder if you can update on the status of the 31 Chinese citizens detained in Zambia for illegal mining, and if they have them released, deported or charged? A: I would like to thank you for the care you have shown for the 31 Chinese citizens detained in Zambia. I am pleased to tell you that after China's Foreign Ministry and the Chinese Embassy in Zambia made multiple representations with the Zambian side, the 31 Chinese nationals have left from Zambia for China by air on the afternoon of June 6 local time. According to my information, relevant departments of Zambia allowed normal departure of these 31 people. Before leaving, they wrote a letter of thanks to the Chinese Embassy to express their appreciation of and satisfaction with the work done by the embassy. Q: Angola's state news service said that China has agreed to partially forgive some of the debts that Angola owes China. I wonder if you can confirm that. A: President Xi Jinping pledged that China will write off the debt on outstanding intergovernmental interest-free loans due by the end of 2015 owed by designated least-developed countries, landlocked developing countries, and small island developing countries, when addressing the UN Development Summit on September 26, 2015. What you mentioned shows that China is delivering on its promise. Q: Yesterday the Kabul Process conference opened in Kabul of Afghanistan to discuss security and peace. Representatives of several neighboring and other important countries, including China, participated. Keeping in view the current security situation there, to what extent this conference will play a role to bring peace and stability to Afghanistan? A: Peace and stability in Afghanistan is highly relevant to security and development of the neighboring countries and the region. As a close neighbor, China supports Afghanistan in conducting peaceful reconstruction and advancing reconciliation. The Foreign Ministry's Special Envoy for Afghan Affairs Deng Xijun attended the Kabul Process conference yesterday. Along with other members of the international community, China stands ready to continue to play a due constructive role for an early realization of national and political reconciliation as well as peace, stability and development in Afghanistan. Q: According to the Yonhap News Agency, the ROK presidential office said that the deployment of the THAAD anti-missile system should be subject to environmental review. Do you have any comment on this? A: We have noted the report. I shall say China's stance of opposing the THAAD deployment by the US in the ROK is clear, consistent and firm. Follow-up: Wouldn't you see the suspension of the further deployment as a positive signal, as an affirmation of China's opposition to THAAD? A: We follow closely the discussion of the relevant issue in the ROK. China's position is clear-cut. We are firm in opposing the deployment of THAAD by the US in the ROK. Q: Do you have any update on China's position on the situation in the Gulf and the decision by several countries to cut diplomatic relations with Qatar? A: We closely follow the development of the situation. Peace and stability in the Middle East and the Gulf region meets the common interests of countries in the region and around the world. The Chinese side hopes that relevant parties can properly resolve differences through negotiation on the basis of mutual respect and non-interference in internal affairs and remain in unity and harmony. This will help join regional countries together in the fight against terrorism and extremism. China will continue to support stability and development in the region and conduct bilateral and collective cooperation with Gulf countries and Arab states.